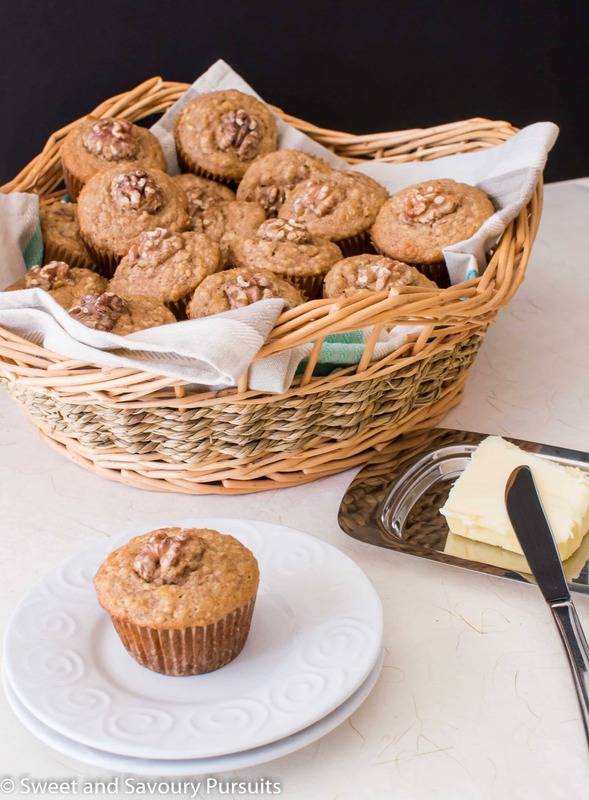 Made with whole wheat pastry flour, these Banana Maple Walnut Muffins are delicious, moist and tender. They’re perfect for breakfast or a quick snack on the go. My favourite way to make use of overripe bananas is to make banana muffins or quick breads with them. Muffins are great because they’re already individually portioned, stay fresh for a few days and can easily be frozen for consumption later on. I love to treat myself to a muffin still warm from the oven with a dab of butter on it, yum! 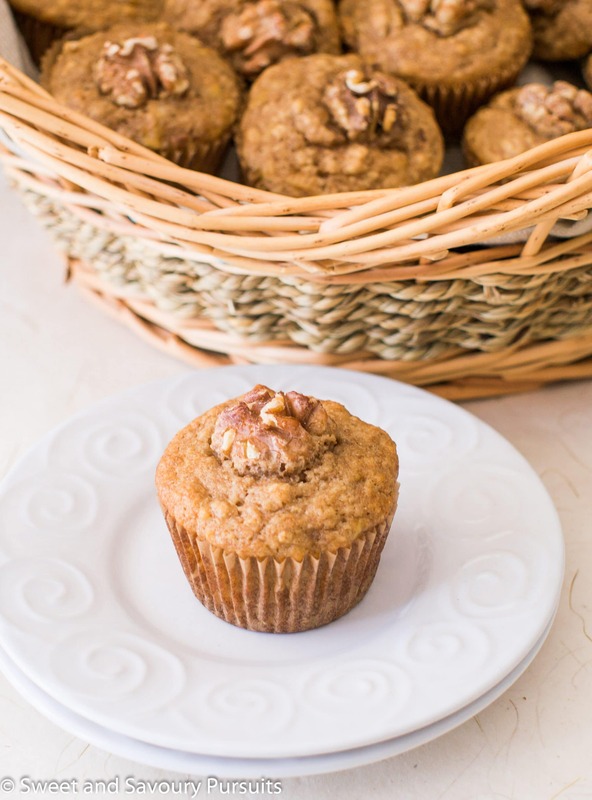 This recipe makes incredibly moist and tender Banana Maple Walnut Muffins. I used whole wheat pastry flour and quick cooking oats for this recipe. You can use all-purpose flour, but whole wheat flour is more nutritious. Do make sure to use whole wheat pastry flour and not regular whole wheat flour which causes baked goods to be heavier. Since maple syrup season is upon us, I decided to use pure maple syrup as a sweetener in this recipe. The flavours of maple syrup, bananas and walnuts go perfectly together. I spiced these with a touch of cinnamon and nutmeg which makes them even more delicious! 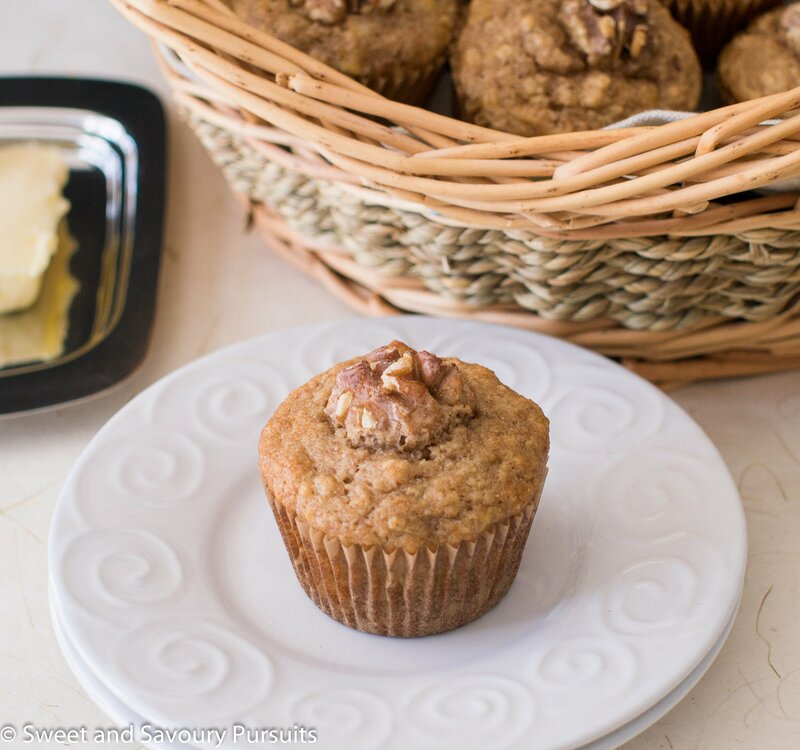 Made with whole wheat pastry flour, these Banana Maple Walnut Muffins are delicious, moist and tender. They're perfect for breakfast or a quick snack on the go. In a large bowl, whisk together flour, oats, cinnamon, nutmeg, baking powder, baking soda and salt. In a separate bowl, whisk together the oil, yogurt, brown sugar, maple syrup, eggs, vanilla and mashed bananas. Add in the walnuts and give it a quick stir. Do not over-mix the batter or you will have tough muffins. Spoon the batter into the greased or paper-lined muffin cups filling almost to the edge of the muffin cup. Bake until a toothpick inserted in the centre of the muffin comes out clean about 18 to 20 minutes. Let the muffins cool in the pan on a rack for 5 minutes. Remove the muffins from the muffin pan and place onto a wire rack to cool. Muffins can be stored in an airtight container for up to 3 days or frozen for later consumption. *Toasting the walnuts will add to the texture and the flavour of your baked goods. You can toast walnuts in a 350ºF oven for about 8-10 minutes or until they are lightly browned and fragrant, let cool and chop coarsely. Just made these. Delicious fresh out of the oven! Hi Munira, happy to hear that you made and liked these. Take care. Hi Mona, that’s great, hope you like them as much as I do!